BOND: 10 Things You Might Not Know About MOONRAKER | Warped Factor - Words in the Key of Geek. 1. Moonraker's journey to the screen is a long one. Ian Fleming had originally intended the novel, published in 1955, to be made into a film even before he began writing it, basing the story on an original manuscript of a screenplay which had been on his mind for years. Then, after the novel was published, American actor John Payne offered Fleming $1,000 for a nine-month option on Moonraker, plus $10,000 if production eventually took off. The negotiations broke up the following year due to disagreements regarding Payne's ownership of the other Bond novels, and Fleming started looking for a new deal to bring Moonraker to the screen. Eventually the Rank Organisation optioned Fleming's own screenplay, but they wound up not developing the film and Fleming purchased the rights back in 1959. By 1977, and the release of The Spy Who Loved Me, all but one of Fleming's full length James Bond novels had been adapted for the screen by EON Productions, leaving only Moonraker still to be filmed. However, producers had already decided that the next 007 movie would be For Your Eyes Only, and inserted that title in the closing credits after the customary "James Bond will return in...", but after the huge success of Star Wars and Close Encounters of the Third Kind it was decided to finally head into space and dust down Moonraker for its big screen outing. So what was intended by Fleming to be the very first James Bond movie made, ended up being the last of his Bond novels to receive a screen adaptation. 2. As with several previous Bond films the story from Fleming's original novel is almost entirely dispensed with in favour of a film more in keeping with the era of science fiction. 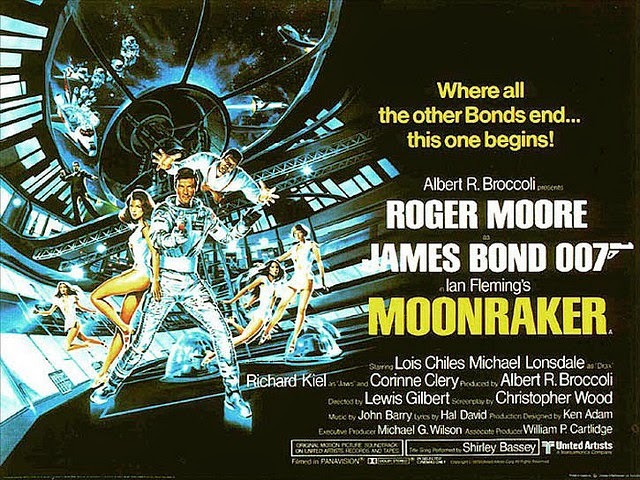 Christopher Wood's screenplay of Moonraker differed so much from Fleming's novel, with little more than the name of Hugo Drax used, that Eon Productions authorised the Wood to write a novelization. It was named 'James Bond and Moonraker' to avoid confusion with Fleming's original novel Moonraker. 3. Initially, the chief villain, Hugo Drax, was to be played by British actor James Mason, but due to high taxation in England at the time the decision was made that the film would be an Anglo-French co-production under the 1965–79 film treaty, and the majority of the filming would take place in France. Mason was dropped and French actor Michael Lonsdale was cast as Drax, along with Corinne Cléry as Corinne Dufour, in order to comply with qualifying criteria of the agreement. 4. Drax's henchman Chang, played by Japanese aikido instructor Toshiro Suga, was recommended for the role by executive producer Michael G. Wilson, who was one of his pupils! 5. Jaws was intended to be a villain against Bond to the bitter end, but director Lewis Gilbert stated on the DVD documentary that after The Spy Who Loved Me he received so much fan mail from small children saying "Why can't Jaws be a goodie not a baddie" that as a result he was persuaded to make Jaws gradually become Bond's ally by the end of the film. 6. Diminutive French actress Blanche Ravalec, was cast as the bespectacled Dolly, the girlfriend of Jaws. Originally, the producers were dubious about whether the audience would accept the height difference between them, and only made their decision once they were informed by Richard Kiel that his real-life wife was the same height. 7. Except for a few brief close-ups, the entire sequence of Bond, Jaws and the pilot falling from the plane with Bond and the pilot fighting for a single parachute was actually shot in free-fall. The 7 pound camera for these sequences was mounted on the helmet of another skydiver, and a few shots are of the cameraman's own arms and legs. Stuntmen Jake Lombard and skydiving champion B.J. Worth wore parachutes concealed within their suits. The "parachute" they fought over was actually a dummy 'chute which had to be removed before the stuntman could use the real parachute underneath. Lombard would don and remove the dummy 'chute up to three times in a single jump. The actual parachutes used by the stuntmen had both a main and reserve 'chute concealed within the suitcoats. A breakaway seam ran down the backside which allowed the parachute to be opened without the need to remove the coat. There were only sixty to seventy seconds of freefall time between when the stunt performers exited the aircraft and when they had to activate their 'chutes. After factoring in the time needed to get the performers and cameraman into position after leaving their plane, only a few seconds of film could be shot per jump. Therefore, the entire sequence required 88 jumps and five weeks to film, just to produce the two minutes of footage in the final film. 8. For the scene involving the opening of the musical electronic laboratory door lock in Venice, producer Albert R. Broccoli requested special permission from director Steven Spielberg to use the five-note melody from his film Close Encounters of the Third Kind. Spielberg agreed, but said Broccoli would owe him one, and so in 1985 Broccoli returned the favour by fulfilling Spielberg's request to use the James Bond theme music for a scene in Spielberg's film The Goonies. 9. Moonraker was the third of three Bond films for which the theme song was performed by Shirley Bassey (following Goldfinger and Diamonds Are Forever), but Miss Bassey was not the first choice. Kate Bush and Frank Sinatra were both considered to record the theme, before Johnny Mathis was approached and offered the opportunity. However Mathis, despite having started recording with John Barry, was unable to complete the project. With just weeks to go until the films release Barry asked Miss Bassey to do him a favour and sing the theme song. She did, of course, although she never regarded the song 'as her own', and did not promote the theme tune when it was released as a single. 10. Moonraker was noted for its high production cost of $34 million, almost twice as much as predecessor The Spy Who Loved Me, and more than the combined budget of the first six James Bond movies - in fact, Maurice Binder's title sequence cost more than the entire budget of Dr. No! However, even though it received very mixed reviews after release, nearly all the critics agreed that the film's visuals were exceptional, propelling Moonraker to become the highest grossing film of the James Bond series with a worldwide take $210,300,000, a record that stood until 1995's GoldenEye. James Bond will return next Monday in 10 things you might not know about For Your Eyes Only.